Here you will find jewelry designed by Warlock. Currently, he has a series of necklaces done in aged brass and crystal. 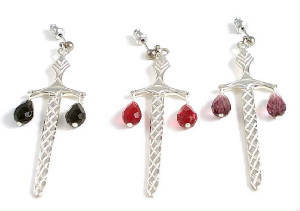 His Sterling Silver and Crystal Celtic Sword earrings are also available. 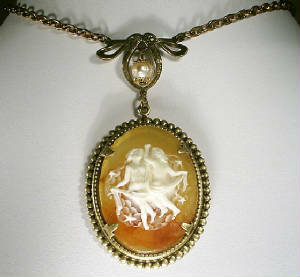 The first series of necklaces use previously unset Zodiac Cameos from the 1960's. These are mounted in an aged brass bezel. The necklaces are fashioned with crystal beads or natural stones and pearls to represent the appropriate birthstone of the wearer. This piece above is appropriate for a wearer born in the month of June (pearl) under the sign of Gemini. The aged brass Bow suspends the fresh water pearl (the camera flash has caused the pearl to reflect the brass color of the bow) above the cameo. Another set of Warlock's birthstone creations are shown below. In the past, jewelry known as Mother's or Grandmother's necklaces have been interesting but not very elegant. Warlock has created a series of Mother and Children Birthstone pieces that range from elegant and inexpensive to the infamous "If you have to ask, you can't afford it!" The first is the Birthstone Necklace series. There are two basic styles. The style is acutally dependant upon how many birthstones must be shown on the necklace. If the number of birthstones is an even number, then the Bow Connector is used. If the number of birthstones is an odd number, then the filigree connector is used. 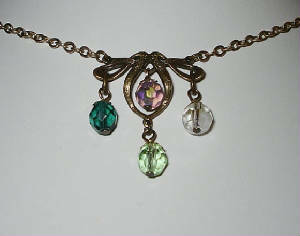 The necklace shown above has the mother's birthstone centered in the bow and the children's birthstones surrounding it. This is appropriate mothers who have one or three children/grandchildren. 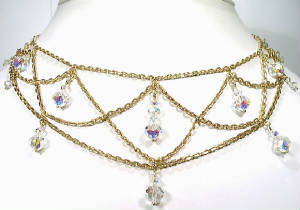 For larger families, the extra birthstones would be mounted on links between the chain and the bow. In this manner, almost any even number of birthstones can be placed on the necklace. The necklace shown above is created for the mother who has two or four children/grandchildren. By adding crystal links between the chain and filigree, it is possible to have almost any odd number of birthstones on this necklace. Warlock has also introduced an earring design for the Mother and Children line of jewelry. By using a chandelier design and crystal beads, the number of birthstones that may be used can be as many as 22. The design above has six crystals on each earring. One for the Mother and one for each of five children. All of the Mother and Children necklaces are shown with aged brass chain, findings and connectors. Crystal beads or natural stones or pearls are used to represent all the months of the year. Our prices for the aged brass jewelry are very reasonable. Creations in Silver Ox, Sterling Silver Plate, and Gold Plate are also available. If you are interested in a quotation, use the form shown below to contact us. 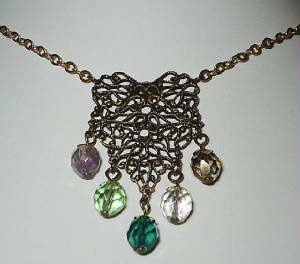 Using his engineering skills, Ryder has designed this lovely Italianate Filigree and crystal necklace. This kind of filigree design might have been seen during the Edwardian period. The crystal beads are Swarovski Clear Crystal AB, but the necklace may be fashioned with any other Swarovski color. This necklace is designed to drape perfectly, no matter the length! The necklace pictured was created with vintage gold plated cable chain. It can also be fashioned with Sterling Silver chain. Use the contact sheet below for a price quote. An original Ryder Cooks design cast in solid sterling silver, these beautiful and unusual Celtic Sword pendants may be ordered with a variety of color choices in Swarovski Crystal. They are a bit over 2-1/2" in length from bail to tip. The pendants sell for $4.50 without crystals, and 6.00 each with crystals. They may be ordered from the request sheet below or through our Ebay store. Earrings made from these same pendants are also available. They come with surgical steel posts and clutches or sterling silver earwires. 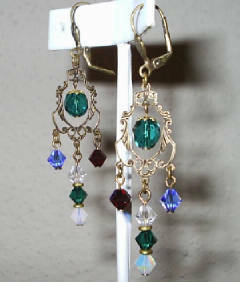 Earrings are 10.00 the pair without crystals and 12.50 the pair with crystals. 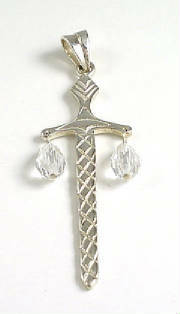 TO ORDER CELTIC SWORD PENDANTS, CLICK HERE! Please describe the necklace or earrings which interest you.